We first met Vera Hallett and her cousin Christine Rea when they came on one of the site tours on a very wet day in May. After visiting the exhibition at Tudor House, they came into the Hive to talk about some of their memories of Lich Street. Vera was born at 15 Lich Street in the 1940s, later moving to 1 house No 2 Court where she lived until she moved from Lich Street in 1955. Christine moved from the area when she was three, but often visited her cousin and remembers the street well. Number 15, opposite the Punch Bowl Inn, was a large house separated into rooms and occupied by several families who shared a kitchen and a toilet. Vera's neighbours included Mrs Dalton, Mr and Mrs Perry, Mr and Mrs Butcher who ran a boarding house for homeless people as well as Mrs Butcher's brother Arthur Abbott, the chimney sweep who we found recorded in the archives and looked at in an earlier blog post. Vera and Christine told us that there was no running hot water and they had to wash in cold water in a shared sink. They remembered that each family had an allocated wash day when their father would light the fire under a big boiler to heat the water, whites were always washed first, then the coloureds and the girls would come home from school at lunchtime to find lines of washing in the yard or, if it was wet hanging, in the kitchen steaming up the whole house. 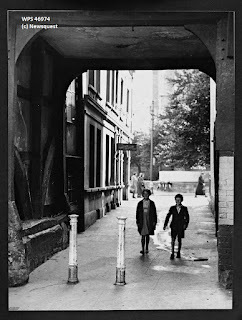 Across their backyard, where they had to go for a wash and to the toilet, was a flat roof and from here they could look into the back yard of Mr Holt the butcher who had his shop on the Shambles. Vera and Christine remembered that, like a lot of the butchers in the street, he used his backyard to slaughter the animals he sold in the shop. 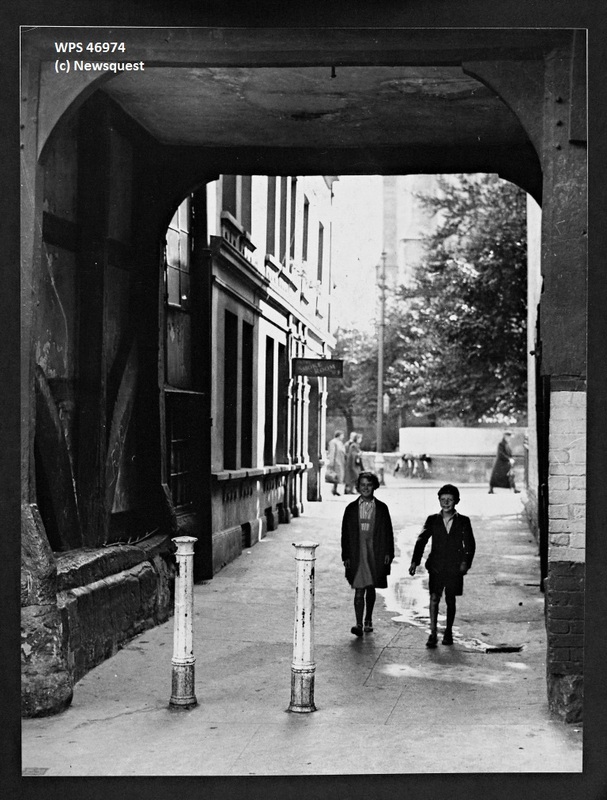 Although the buildings were derelict and they remembered cockroaches in the houses, Vera and Christine felt there was a sense of community in the street and neighbours helped each other, particularly in times of trouble. If you've been past the site recently, you'll have seen that the engineers have filled in the area of the dig in preparation for the roadworks. Many people are surprised that the site is being filled in with concrete; in fact, although it may seem strange, it's the best way to protect the archaeology! A special mix of low-density foam concrete is used, all of the archaeological structures and deposits are protected with impermeable sheeting and sensitive features are lined with protective foam boards. This is all to ensure that there's no damage caused by vibrations or compaction from the road surface and turning area above the site. When the area is redeveloped again in the future, the concrete can be easily removed to expose the archaeological remains beneath. There was lots of interest in the idea of a viewing area, leaving the remains exposed or visible beneath a glass panel. It's a great idea, and we're pleased that so many people have shown an interest. Although preserving exposed archaeological remains whilst ensuring they don't fall to pieces is costly and difficult, it is possible, and we always like to see imaginative ideas for presenting our city's history! In this case, though, there was one major problem: the part of the site containing the walls, cellars and footings of old Lich Street will be underneath the road and turning area for buses/lorries. Without moving the road even closer to the cathedral (which would disturb more archaeological remains including part of the Cathedral cemetery), or bridging the area (which would raise the road surface and block the view of the cathedral), we can't avoid this. Sadly, it's just not safe or practical to have a viewing area or a void underneath the road itself. However, everything has been safely preserved, and the dig has given us a fascinating glimpse into almost 2000 years of history in the heart of Worcester! It's not over yet, either: as the project continues, you'll see our archaeologists down there keeping a 'watching brief', recording and protecting any more archaeological remains exposed during the work. If you didn't get a chance to come and see our exhibition at Tudor House Museum last week, some of the displays and photographs will be staying in the museum for a few more weeks. If you're interested in seeing and handling some of the finds, we'll be at Tudor House Museum on Friar Street, Worcester this Thursday 23rd July and Saturday 25th July, 10:00 - 16:00, as part of the annual nationwide Festival of Archaeology. As well as the finds, we'll have pictures from the dig and a collection of historic photographs and paintings of the area from our archives. Our specialists will be on hand to answer your questions. All ages welcome! Hello, my name is Claire Tippins. I've been on the work placement for four months, from the Heart of Worcestershire College as part of my two year Supported Internship program; I will be giving you an insight in what the Archive and Archaeology service do once they've finished digging the site (because archaeology's not all about digging!) . Once the digging on the site is complete, all the artefacts go through processing where they are carefully cleaned to remove dirt, soil etc. They are dried, then marked with codes that identify the areas where they were found. Then they are weighed, recorded and further inspected to identify their date and purpose. After inspection they will either show some of the artefacts in public events or they are wrapped up, or placed in a plastic bag and placed in a box. If the artefacts are metal they are placed in a sealed plastic box with special (silica) gel that keeps them dry and helps prevent corrosion. Another thing we do is a lot of research in trade directories, business records, wills, census records, images, books etc. We do this to know who was living there and what their occupation was, and we do come across some interesting information. I enjoy all the work I do here, it's different every day and the staff are incredibly friendly and relaxed. They enjoy my company, I love working here! ...We didn't bribe her to say that, honest! One significant location around Lich St was the Punch Bowl, just off the street through the Lich gate. It was one a number of pubs in the locality, including (confusingly) the New Punch Bowl opposite the Lich Gate. Plenty of people who could recall the area said they remembered the pub. Within the archives last week we came across an inventory amongst an envelope of document which were passed to us from Birmingham Archives as the contents related to Worcestershire. 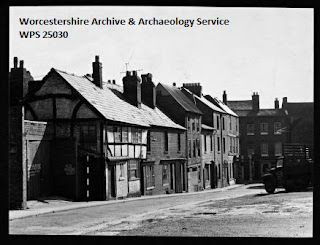 The inventory was written in March 1958 by Phipps & Pritchard of Kidderminster, (Valuers, Auctioneers & Surveyors), probably when it closed as it appears to be a settlement and includes money for the remaining unexpired lease. The rest is an inventory room by room of the pub and living areas, going down to the level of each coat hook and mop & bucket. Unsurprisingly there was quite a bit of stock left both in the bar and in the cellar. In the bar this included half a bottle of Pimms, 4 bottle of Guinness, 1 bottle of Brown Ale, 990 woodbines and 20 packets of polos. In the cellar the stock included 38 gallons of beer, a vast array of bottles of spirits, 8 bottles of Baby Cham and 12 bottles of rum. When the Punch Bowl closed down the licensee went to Ronskwood, where he open a pub and named it the Punch Bowl after his former premises, which is still there today. 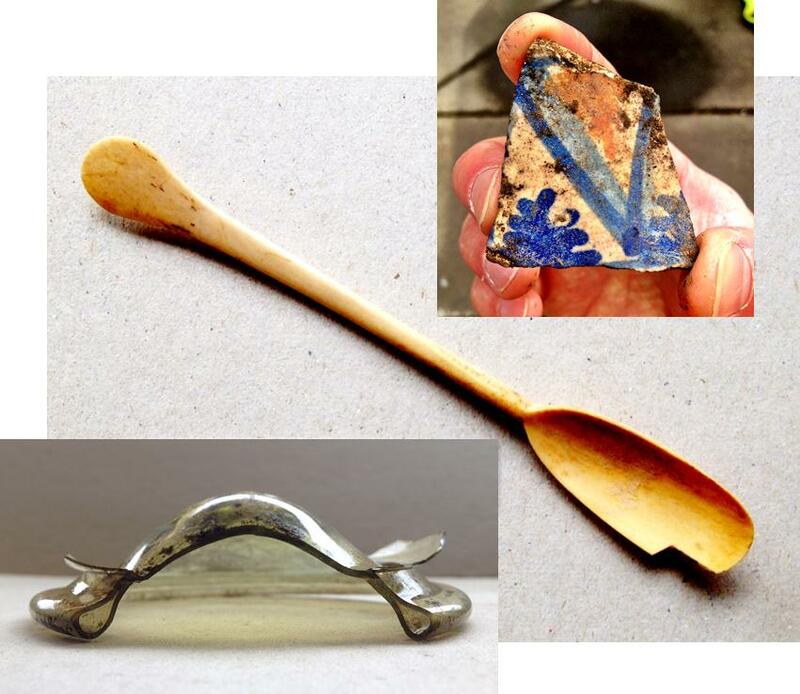 Next month we will be at Tudor House Museum with finds from the Cathedral Roundabout dig for you to see and handle, along with historic photos and information about the excavation. We know lots of people have been asking whether we would repeat the pop up exhibition we did at St Helen's, and we are doing so at Tudor House, which is just round the corner from Lich St.
We'll bring along some of the more interesting finds, such as the glass vessel, late 16thC German Stoneware jar, WWII Military Police cap badge and other items which we've featured on the blog. We'll also have historic photos of the area and old maps, and there'll be photos, film information about the archaeology so if you missed the tours you'll be able to catch up on what we discovered. We will be at Tudor House Museum, Friar St, on Thursday 23rd and Saturday 25th July 10am-4pm, coinciding with the Festival of British Archaeology. Some of the displays boards will then stay there for the following few weeks. Entry to the museum is free. We recently interviewed Pat Harbourne about her memories of growing up in Worcester. Pat told us about some of the shops in the Lich Street area and described her journey from the bottom of London Road past The Commandery, Clapton's Bakery, Lawley's and the Lych Gate up to the High Street. Updates from archaeology projects and excavations supported by Worcestershire Archive and Archaeology Service.